I often get emails from people who have just started taking warfarin (brand name Coumadin) who are overwhelmed by how much there is to learn. They just don't know where to start. We have lots of useful information on ClotCare and have tried to organize it so that it is easy to find what you are looking for, but sometimes it seems newbies to warfarin don't know where to start. Below are some postings and frequently asked questions (FAQs) that should help you to get a broad understanding of warfarin (Coumadin) therapy. In other words, start with these postings and FAQs. :) Just click the title to go to the posting. FAQs About Warfarin (brand name Coumadin) - This posting answers some of the questions most often asked by patients new to warfarin (Coumadin). It also answers questions that many new warfarin patients simply don't know to ask. Understanding the PT-INR Test - This posting explains the test that is used to measure how well warfarin is working. The results of this test help your doctor to know whether you are taking too much warfarin, not enough warfarin, or just the right amount. It is important for you to understand what this test is all about and what the numbers mean. Patient Self Testing - This postings discusses the use of a handheld device that a patient can use to test his/her own INR at home. Post-thrombotic Syndrome - This FAQ posting explains post-thrombotic syndrome (PTS). PTS is a condition of ongoing pain and swelling that may happen in a patient who has had a blood clot in the leg. The posting also discusses ways to prevent and/or minimize the severity of post-thrombotic syndrome. Graduated Compression Stockings - This FAQ posting answers questions about graduated compression stockings. Patients who have had a blood clot in the leg are encouraged to wear graduated compression stockings for at least 2 years following the clot. 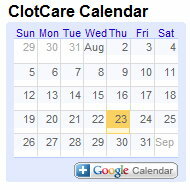 How to Use ClotCare - This posting explains how information can be located easily on ClotCare. I encourage you to review it so you will able to find the information you want when you want it. We are continually adding new information to ClotCare and updating the postings that are already on the site. If you would like to receive periodic updates when new information becomes available, you may sign up for the ClotCare email list. Also, if you have questions and cannot find the answers, you are welcome to submit your questions by email to webmaster@clotcare.com.